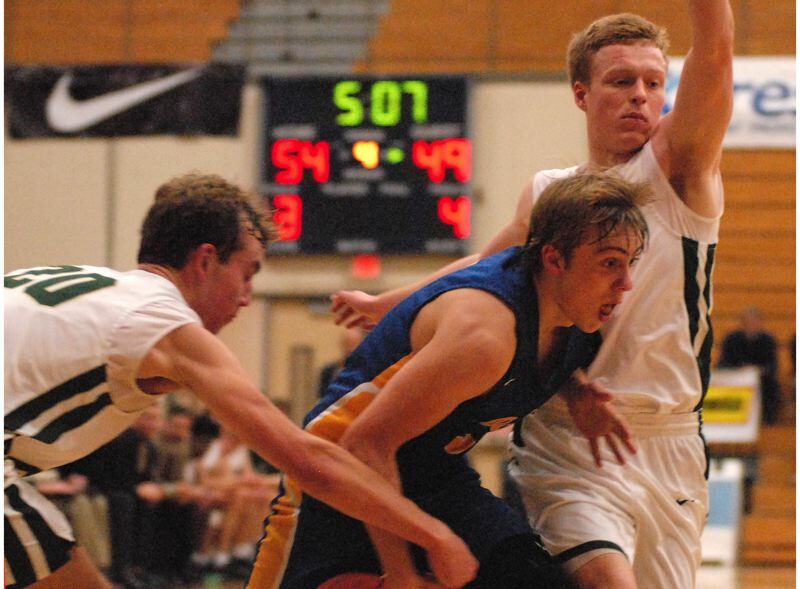 HILLSBORO — The Barlow boys basketball team could not dial it in from deep, sinking their chances in a 63-59 loss to Jesuit in the opening round of the Les Schwab Invitational on Wednesday at Liberty High. The Bruins went 2-for-20 (.100) from behind the arc, leaving them unable to catch the Crusaders in the fourth quarter. Barlow's lead scoring duo of Jesse White and Evan Inglesby didn't hit from deep, but were effective attacking the basket, going a combined 16-for-19 (.842) on drives into the lane or pull-ups just outside the paint. Barlow looked to challenge early in the fourth quarter when Joey Wolcott knocked a ball loose on the defensive end, and Jaren Hunter took it over halfcourt while White directed traffic from the corner. In the end, Inglesby found White slipping free along the baseline for a three-point play that pulled the Bruins within 47-45. Jesuit got those points right back when Matthew Levis hit a clutch corner 3 on his way to a team-high 16 points — 12 of them coming from behind the arc. Barlow would remain two steps behind on the scoreboard the rest of the way. White hit a pair of pull-up jumpers just inside the arc to keep the Bruins within striking distance down the stretch. Jesuit missed at the free-throw line, but Barlow gave the ball back when a long pass sailed out of bounds. 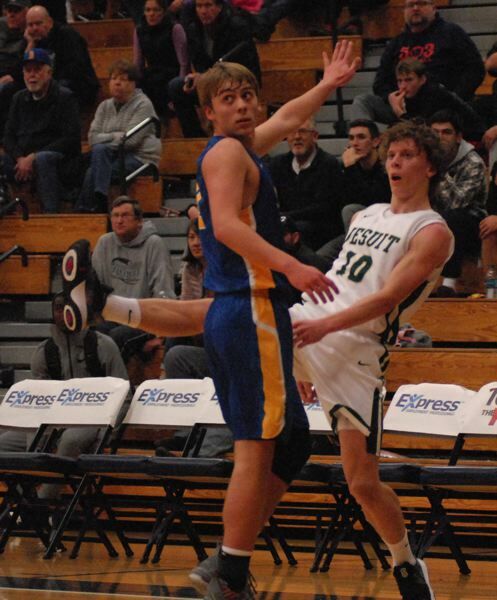 Jaren Hunter drew a charge on the defensive end that fouled out Jesuit starter Justin Bieker. Barlow missed a corner 3 — its final chance to make it a one-possession game. The tournament continues through the weekend with Barlow taking on Churchill in a 9 a.m. consolation game Thursday. The Les Schwab title game is set for 8:30 p.m. Saturday. 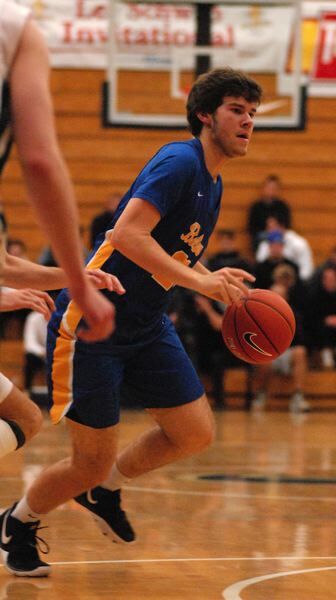 The Bruins started well Wednesday with White driving to his left and beating Jesuit's Will Shaeffer to the rim for the first points of the game. Inglesby combined with Hunter on a give-and-go for another layup. A few minutes later, Jesuit lost the handle and Inglesby scooped it up on the bounce and in the same motion flung the ball ahead to White for a breakaway layup. The two backcourt guards would trade places moments later when White swiped a steal and sent a long pass ahead for Inglesby for a dunk and a 14-6 lead. Jesuit got back on its feet in a hurry when Levis hit back-to-back 3s to pull the Crusaders within two at the end of the first quarter. The Crusaders would put together a 13-1 spurt, taking the lead when Connor Kollas fed Braden Rice for a layup, then sank a 3 himself on the next possession. Jesuit had a chance to stretch it to a double-digit margin late in the first half, but Barlow got back in it after Josh Nomie stole the ball and broke free down the sideline for a layup. Hunter drew a charge to end Jesuit's next possession, and he drove the lane on the offensive end and found Jared Vedus for a 3 out of the corner. Barlow had two chances to pull even by the half, but Inglesby saw a 3-point try rattle out, and Vedus watched his half-court heave clip the side of the rim. The teams traded the lead five times with Barlow gaining its final upper hand at 34-32 when White drove inside and put the ball over the rim. Jesuit moved in front to stay on an Aiden Williams 3-pointer midway through the third quarter. Barlow (59) — Jesse White 22, Evan Inglesby 16, Jared Vedus 8, Jaren Hunter 6, Noah Lowery 5, Josh Nomie 2, Ndayizeye, Wolcott. Jesuit (63) — Matthew Levis 16, Justin Bieker 12, Will Shaeffer 8, Braden Rice 8, Connor Kollas 8, Will Spitznagel 6, Aiden Williams 3, Sam Wiltjer 2, Bunn. This story is slated for our Friday, Dec. 28, print edition.